Spray and wax finishes for bare wood picture frames. Contact us to discuss your requirements, or for custom sized mounts use the online price calculator for an instant quote. Choosing from a broad palette of waxes, stains, pastes and lacquers, and applying them in varying combinations either by hand or with a spray-gun, we can create a multitude of different effects. Trying to choose an appropriate finish to bring out the best in an artwork can be tricky. To make the choice a bit easier we keep dozens of samples in our workshop that can be viewed next to your art. 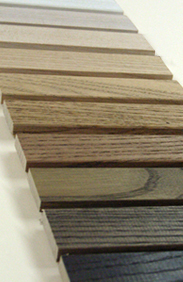 If what you are looking for is not among them, we can make up new samples just for you, to meet your specifications. If it's a solid colour that you're looking for, you can choose from any colour with a Ral number and we'll get it mixed to order. We use a range of acrylic lacquers in different grades of sheen, from matt to high gloss. A sprayed finish leaves no brush marks, and the durability of the lacquers we use makes them ideal for frames that travel from gallery to gallery. Dust and finger marks can be easily removed with a soft cloth dampened with a weak solution of detergent. The finish pictured (left) was produced for a client who asked for a "warm" black. The wood is tulipwood. Base coat is a deep red water-stain applied by hand. Next came two sprayed coats of ebony spirit-stain. Finally, two light top coats of sprayed acrylic lacquer. The result is a full grained finish, with the light colour of the tulipwood helping to project the red base tones through the slightly translucent black layer.